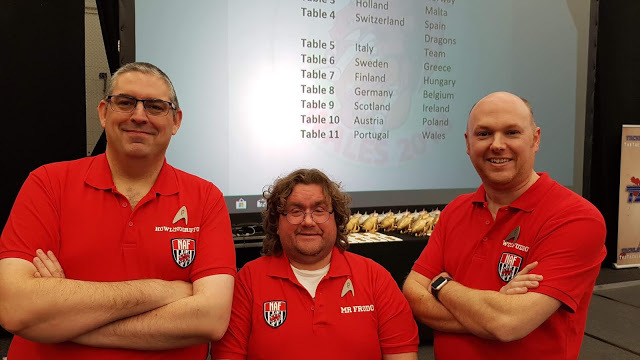 When Howlinggriffon (Darren) and Mr_Frodo (Andrew) asked me to fill a gap in their Team Redshirts Europen squad I was both delighted an excited to join them in Cardiff, Wales on the weekend of 27th-28th October. With families in tow, we took shelter at the Mercure Hotel, just a short Uber ride away from the Swalec stadium (conference centre). While the long-suffering wives went off and enjoyed the delights of Cardiff, the three of us enjoyed some quality nerding. Well, these guys know their Star Trek, and I’ve watched my fair share of episodes & films too… so we thought it appropriate regarding our predicted success at the tournament… Yes, we’re being sent in by the captain to get squished first! Our captain, Howlinggriffon had organised the shirts, badges and had a limited amount of special Star Trek dice to give away to our Day One opponents. Howlinggriffon had brought Wood Elves including a Treeman, and Mr_Frodo had brought his Dwarves. I was coaching a Necromantic team – 2x Werewolves (1xMB, 1xBlock), 2x Golems (1xBlock, 1xGuard), 2x Wights (1x Guard, 1x Tackle), 1x Ghoul (Sure Hands), and 6 zombies (1x Dirty Player), 2x Rerolls and 1x Fan Factor. To read the rest of the article please head over to his blog for the full report!